A growing part of new modes of art production, presentation and distribution seem to be coming from the fringes. They approach the main discourse but they do not inhabit it. Can we consider this kind of marginalization voluntary? Or is it the result of the still uncompromising nature of a centre that is reluctant to be broken up? Perhaps the problem lies in our apparent inability to think without a reference point, without the existence of this discursive “centre point”. Proposals are increasing in number and their ability to generate creative replies is proving to be endless, but their capacity to influence majority audiences is still limited and is located tangentially to the traditional modes of legitimising artistic proposals. This means they run the risk of exhaustion. Should we eternally re-write ourselves in opposition to a centre? If the proposals stay, where are the limits? This course gives different agents from the international art scene the possibility of analysing their stances and reflecting on whether it is pertinent to maintain fringe view-points and how this marginalization should be articulated. They will have to imagine what an ideal situation would be like or towards what end they think joint efforts should be made. All images: Daniel García Andújar / Technologies To The People, Postcapital. Archive 1989-2001. Copyright the artist. 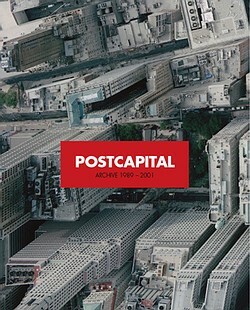 The images throughout this piece are press images for Postcapital. 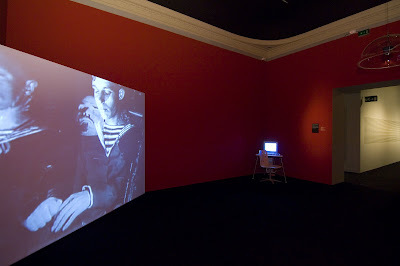 Archive 1989 – 2001, an art project by Daniel García Andújar / Technologies To The People (Nov 22, 2008 – Jan 18, 2009) at the Württembergischer Kunstverein Stuttgart. I’m puzzled by them, not so much because of their form, which reflects several ever present contemporary concerns: an interest in archives and the use of the gallery as a designed environment for perusal of the archive. No, what puzzles me about these images is something more specific about the kind of encounter they invite. Reflexiones sobre las prácticas artísticas actuales más allá del centro. 27, 28 y 28 de noviembre. Plazo de inscripción abierto desde el 3 de noviembre. Una parte creciente de los nuevos modos de producción, presentación y distribución del arte parece actuar desde los márgenes, desde el extrarradio: se acerca al discurso principal, pero no lo habita. ¿Podemos considerar voluntaria esta marginalidad? ¿O es producto del carácter aún irreductible de un centro que se resistiría a ser disuelto? Quizá el problema resida en nuestra aparente imposibilidad de pensar sin un canon de referencia, sin la existencia de ese “centro” discursivo. La presencia de propuestas es cada vez mayor y su capacidad para generar respuestas creativas se mostraría inagotable, pero su facultad para influir en públicos mayoritarios sigue siendo escasa y se sitúa en un lugar tangencial con respecto a los modos tradicionales de legitimación de las propuestas artísticas, corriendo con ello el riesgo de agotamiento. ¿Debemos reescribirnos eternamente en oposición a un centro? Si estos se mantuvieran, ¿dónde situamos los límites? Eine Ausstellung ist eine Ausstellung, ist eine Skulptur, ist eine Analyse, ist eine Frage, ist ein Forschungsfeld – und als solches bei allen Erkenntnisversuchen durchaus Gegenstand der Repräsentation. Auch dann oder vielleicht erst recht, wenn der gefundene Titel “Postcapital” lautet – und entsprechend viele Assoziationsräume eröffnet. Die ersten Bilder? Volkspolizisten auf der Berliner Mauer. Sicher und unsicher zugleich. Überzeugt und ratlos, Uniformierte als menschliche Zeichen des Übergangs. Nur wenige Meter weiter Uniformierte in der gleichen Haltung, mit gleicher Pose, gleicher Geste. Und doch gehen die filmischen Beobachtungen ganz anders weiter. Panzer rollen auf dem Platz des Himmlischen Friedens, Leichen werden in den Straßen von Santiago de Chile eilig weggeschleppt oder achtlos auf Lastwagen gezerrt. Die Zäsur 1989, so macht uns der spanische Medienkünstler Daniel García Andújar deutlich, ist in ihrer Ausprägung nicht denkbar ohne die Geschichte und die Geschichten zuvor. Vom 22. November 2008 bis 18. 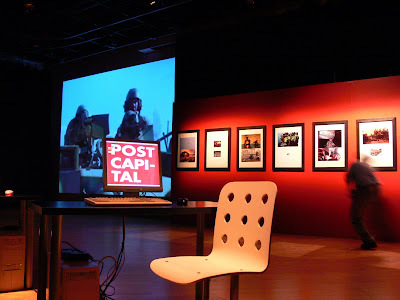 Januar 2009 zeigt der Württembergische Kunstverein die Ausstellung „Postcapital. Archive 1989 – 2001“ des spanischen Künstlers Daniel García Andújar. Das Projekt, das sich gleichermaßen als multimediale Installation, Bühnenraum, offene Datenbank und Werkstatt versteht, basiert auf einem digitalen Archiv mit über 250.000 Dateien (Texte, Audiodokumente, Videos etc. ), die der Künstler in den letzten zehn Jahren aus dem Internet zusammengetragen hat. Mit diesem Projekt wird Andújar 2009 auch an der Biennale von Venedig teilnehmen.